This weekend I did some sprucing up in my neglected living room. It's been coming together since I last wrote about it not feeling "right" two months ago. 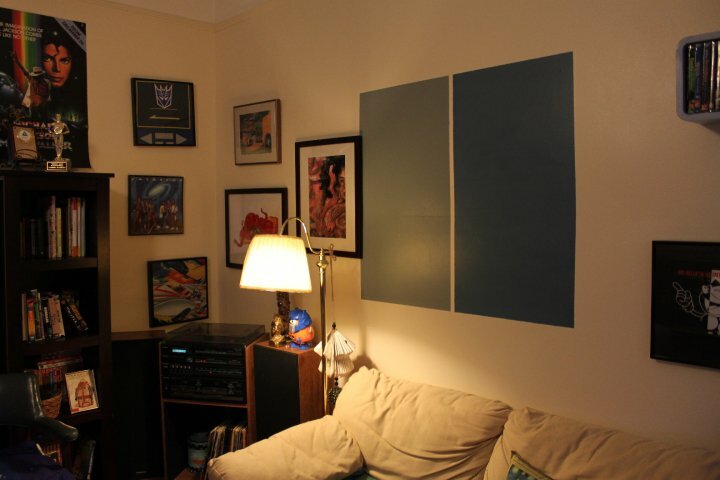 Before: I didn't go with either of the test swatches on the wall as you can see. I got rid of the torn couch and replaced it with my Scandinavian Mid Century Modern Couch, a happy Craigslist find. I mix up the art above my fireplace mantel and I'm pleased with the results this time. The Audrey II is by my friend James Hance, the smaller paintings are by another friend and local artist Nicole Middleton. Two large prints were purchased at an anime con. The carnival mask is from Ponce, Puerto Rico, where all my extended family lives. Toys are collected from flea markets, thrift stores, or my childhood toy box. My Morpheous Chair A.K.A Man Chair is a party favorite. I use the chair more as a latter than casual reading these days, but I still love it. I found it three years ago when I lived in my first apartment. The colorful vintage cuttlefish anatomy poster is from a local antique store. Before: The space felt a bit cramped and imbalanced. It's been a slow processing in editing to make the living room feel "right". I spent a while on Saturday night arranging the photos into a modern rectangular shape. It took a lot of editing but I'm pleased with the results for now. Antique mirror full of toys! I love pop culture and strong juxtapositions. I love how people from my generation across the globe are united by pop culture. I grew up on the other side of the Atlantic, I couldn't speak Italian but my "friends" and I communicated with Nintendo, Sega, Michael Jackson cassets, and cartoons. No matter how our cultures and nationalities differed, we were united by our love of Batman, Mario Brothers, and Sonic the Hedgehog. I've saved a lot of my relics from that era of my life. It's certainly reflected in my living room! What a fun room it is now! I love the bright green walls. I also love how your art groupings are all on a kind of theme almost. I so want that lamp! Thank you! I'm always making/find fun, unique stuff. I love it! You have such great taste and let me say my son would like to move in right this minute. 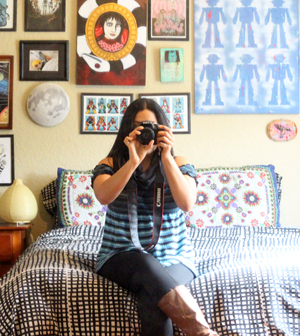 I would love to replicate your pop item wall in his room! Lovelovelove it!! WHat a great transformation! I wish you could come to my house. oh wow! what a difference. i of course love the pop of green! bold colour, and then the red chair? perfect. and so interesting... all the little bits and bobs (did i just say bits and bobs?) are intriguing. You're right- I've got to make sure to cover all that pesky wall space! i love those bold walls. i thought you only did that wall behind the fab sofa, but you did them all. great arrangement behind said fab sofa. it has a much more decorated and snazzy feel. This looks great! I love the couch! I have a big favor to ask of you, recently I had a post on some weight that I lost and now there is a contest and I am in it. You win by getting the most votes so I really need your vote! Could you please go to my blog and follow the directions to vote? I can't thank you enough! Just click below and then vote!!! I see MJ's Off the Wall! I need inspiration like this for our apartment! I like the color you choose. I am following you through Welcome Wednesday. Nice redo! Love the bright green! I'm your newest follower from Welcome Wednesday! I love your decorating. it is so bright and cheerful. You did a fantastic job of blending different things together. Come visit when you get a chance. Oh I LOVE that chair! Where ever did you find it??? Your room turned out great! I really like what you have done with it! It has so much personality to it. I am having a giveaway if you would like to enter!! Have a great week! you have extended family in Puerto rico? come visit!! ps i lpve the after picture and mirror full of toys looks awesome! Good wall paint color. It creates light on the room.